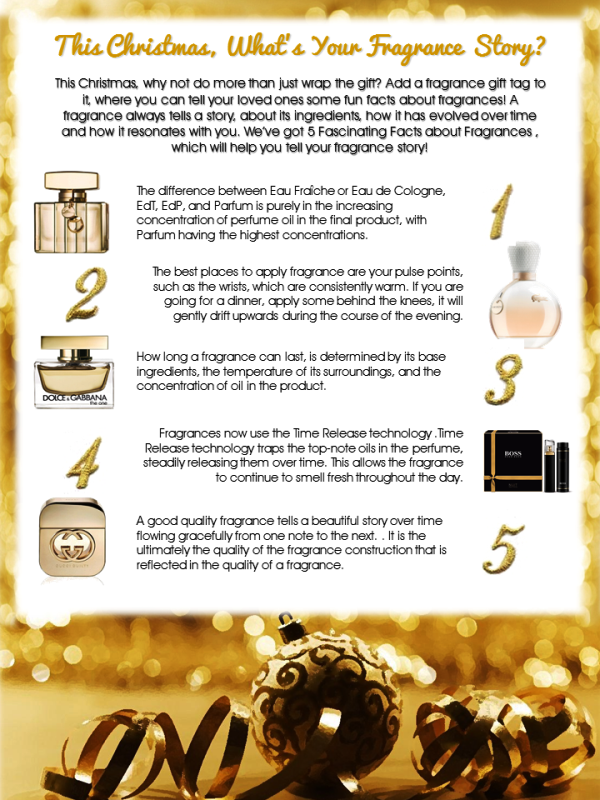 P&G Prestige Quintessential Gift Guide + Wrapping Tips! You are here:Home » Product Reviews » P&G Prestige Quintessential Gift Guide + Wrapping Tips! There’s a saying that goes, “There is more happiness in giving than there is in receiving.” December is the most wonderful time of the year. So bask in the joyful season, & pamper yourself & your loved ones with the best scents from your favourite fashion brands by #P&G! #HugoBoss - Perfect for the man in your life, your best friend, your boss,....... & everyone else! #Gucci Parfums - For that glamorous friend who is never afraid of attracting attention at parties, with confidence, power & that outstanding scent! #Escada - For the scent-less one! Escada fragrances are light-hearted, fresh & delicate - perfect for beginners! Hop over to Win ESPECIALLY ESCADA Elixir Eau de Parfum now! 3 bottles up for grab!! Well, my pick goes to Desire by Dolce&Gabbana! Come this Christmas, why don’t you surprise your loved ones, or even your BFF with these beautiful gift selections to show how much they really mean to you? Give them a Christmas they’ll never forget! Say it with chocolates! 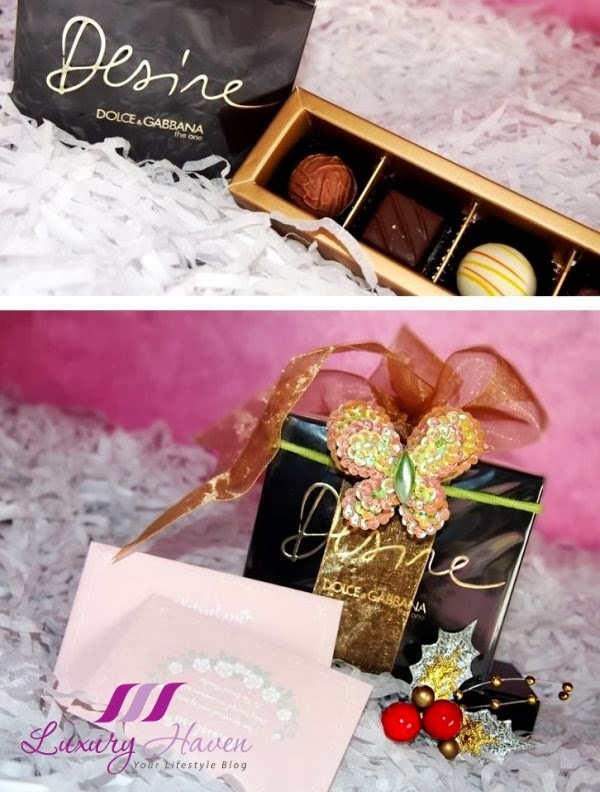 Don’t you think that fragrance & chocolates go hand in hand? 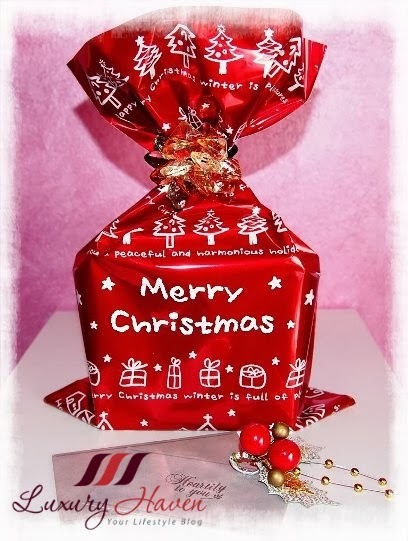 For a fuss-free gift wrapping, simply put the two items together & bind them with a ribbon. Add a sequin hair-tie for an extra touch; you #BFF could also use the hair accessory for her party this X’mas! Want a wrapper that’s more Christmassy? How about putting the #D&G Desire into a red hot gift bag, & seal it with another gemstone hair-tie? If you’ve time & patience for something fancier, try making this fan-shaped gift bag. Check out my tutorial to #DIY this X'mas! *Google has made some changes to Picasa hence the above may not be working till they roll out updates. Please click on the image below to visit Picasa albums for the tutorial. Thanks for patience! So which gift wrapping tips do you like best? 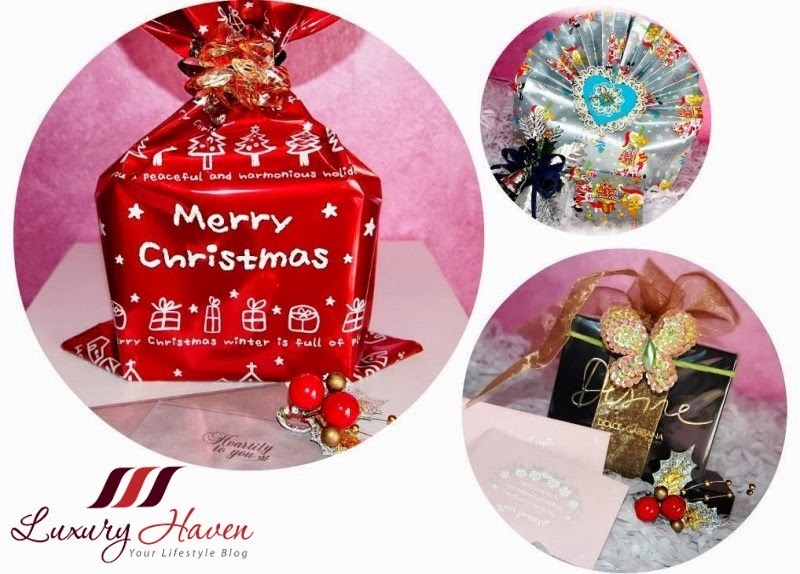 Is the Red Hot Gift Parcel with Gemstone Hair-Tie, the Fan-shape Gift Bag, or the Simple Ribbon with Sequin Hair-Tie? How about adding one of these Fragrance Gift Tags along with your fragrance & a personalized message? Hope you’ve enjoyed the mini tour & have an idea what to get as a present this Christmas with this P&G Prestige Quintessential Gift Guide. 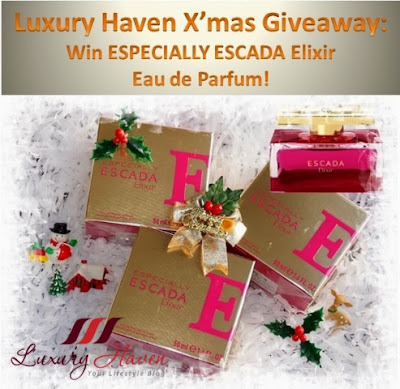 Don't forget to try your luck in our X'mas draw @ Win ESPECIALLY ESCADA Elixir Eau de Parfum now! We've 3 bottles to give away!! Happy Holidays! Neha, thks for sharing with us your thoughts! Have fun shopping! Ken, how about buying it to pamper yourself this X'mas?? Heehee! I agree with the statement; giving is more pleasurable, still I want to receive too. Very creative way of wrapping and the fan style is really mesmerizing. Nava, everyone loves receiving gifts especially on special occasion, don't we? Thks so much for your sweet note! 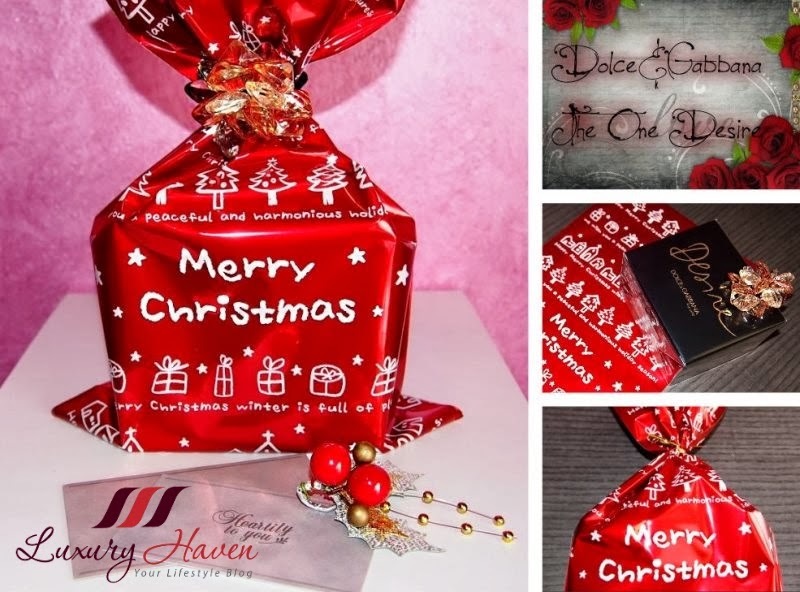 Nice gift wrapping ideas you have there! And what a spread of gift ideas P&G have there too. Reana, hahaha! You should, indeed. So much to shop in SG! P.S. I'm more of a beginner... Escada sounds lovely. Can't take too much scent, although I can certainly understand why Desire is your favorite! I agree with the statement, giving and helping other make us feel happy. Love the wrapping tips. Bal, glad we're on the same page too! Thks, my dear! Lovely gift ideas! I love giving at Christmas too...makes me so happy. Trishie, awesome! Have fun, sweetie! Beautiful gifts! Happy holiday to you too. Rose, thanks & may your holidays be filled with joy & laughter! Louise, I used to be bad at wrapping too until I watched those sales staff helping me to wrap my gifts at the dept stores. I'm glad you've found the tips useful! All are very nice, and I like the Simple Ribbon with Sequin Hair-Tie the most as it's easy to do, simple and looks pretty. Grace, thanks for your sweet note! WC, sounds logical, isn't it? Do not need too much decoration, color mild moderate, small and exquisite, because it have a sense of mystery, is looking forward with excitement! I like the special! Elisia, thanks for sharing your thoughts! I like the Simple Ribbon with Sequin Hair-Tie the most as it's easy to do, simple and looks pretty. I am glad I came here today as I was thinking of some ideas to wrap 2 gifts for my colleagues to be placed under the office's Xmas tree! TM, awesome! Glad you found them informative! Have fun! Wendy, thanks for coming by & happy holidays! Pepper, hope you've got the wrapping tips in time for X'mas!